Ultra violet radiation, especially UV-B radiation (280 – 320 nm), has been hypothesized to be one of the major contributing factors to the decline of amphibian populations worldwide (Gardner 2001, Houlahan et al. 2000, Keisecker et al. 2001). UV-B radiation has been known to cause an increase in the likelihood of premature death, as well as malformations and deformations in a large number of frog (order Anura) populations (Han et al. 2007, Keisecker et al. 2001, Blaustein et al 2003). While the exact effects UV-B radiation has on frog development is currently being investigated and debated, many conclusions can be drawn from past and current research. UV-B radiation by itself is a known problem, but when combined with other factors (pH, temperature, water depth, mold) it can cause a synergistic and additive effect (Bancroft et al. 2008, 2nd reference, Gardner 2001). There has also been a variety of research investigating the role of physiological, molecular and behavioral (Han et al. 2007, Blaustein et al. 2003) adaptations in frog populations. These adaptations are in response to the recent increase in UV-B radiation on the surface of the planet, which has been caused by the recent decrease in stratospheric ozone (Bancroft et al. 2008, Diamond et al. 2002). In some cases, the size of the population may also have an influence the effects of UV-B radiation (Houlahan et al. 2000). Exposure to UV-B radiation can cause various types of lethal or sublethal effects on amphibians (Han et al. 2007). These effects include genetic deformations, improper development, various forms of skin malformations, and premature death (Diamond et al. 2002). Due to the recent decrease in stratospheric ozone and the decrease in surface water level in frog habitats, there has been a significant increase in the amount of exposure to UV-B radiation in frog populations (Bancroft et al. 2008). UV-B radiation affects frogs at nearly all ecological levels: organismal, community and population. Because of these effects, many of frog populations are currently declining in numbers. The declining frog populations have been recorded scientifically and anecdotally, and both results confirm a consistent and long-term decline. This decline has been going on for much longer than normally thought… beginning around 1960 or earlier (see figures 1 and 2) (Houlahan et al. 2000). 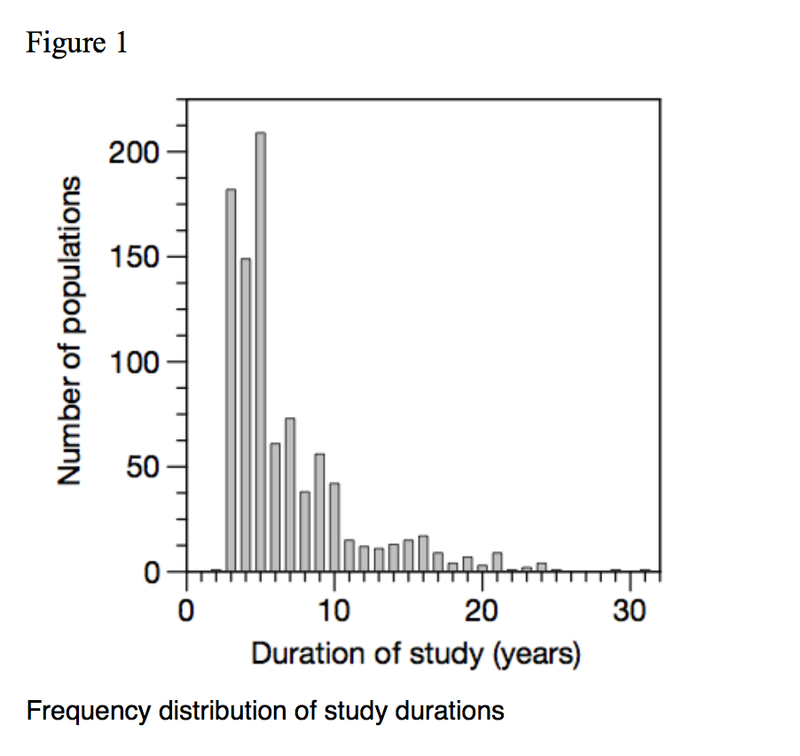 Multiple studies (Bancroft et al. 2008, Pahkala et al. 2001, Ranasen et al. 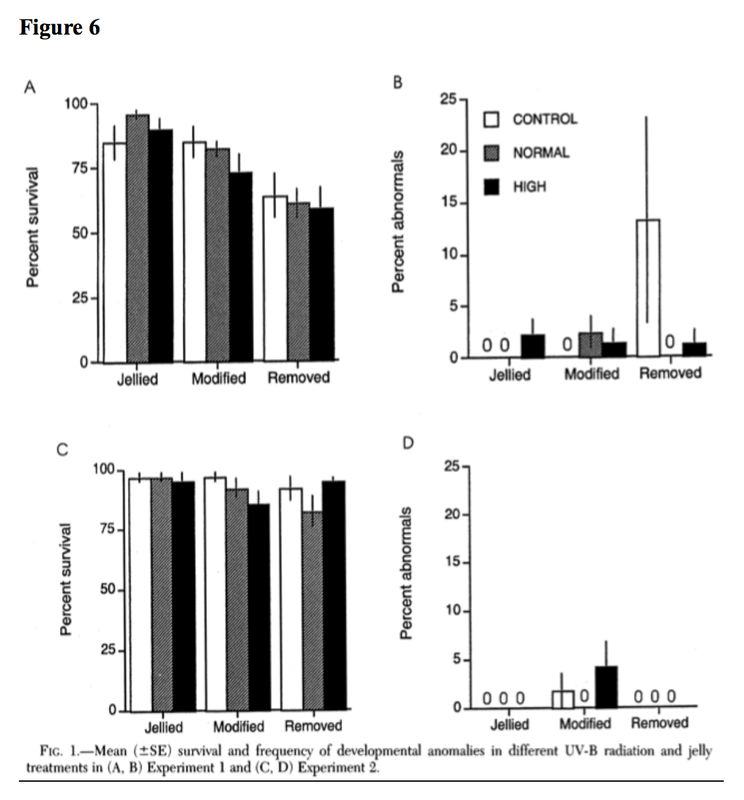 2003, Weyrauch and Grubb Jr 2006) have been done on the effects of UV-B radiation on frog development, with conclusive results: the UV-B radiation has a negative effect on the overall development of frogs. 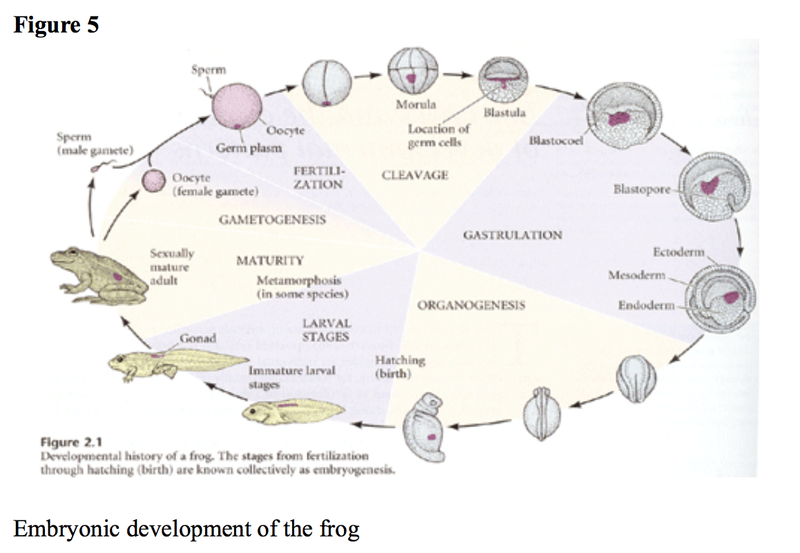 Whether at the embryonic stage or at the larval (tadpole) stage, the exposure to UV-B plays an important role in the correct development of frogs. Because of the increase in surface level UV-B radiation, frog embryos closer to the surface of the water receive almost double the amount of UV-B radiation exposure than the ones only 40cm deeper. 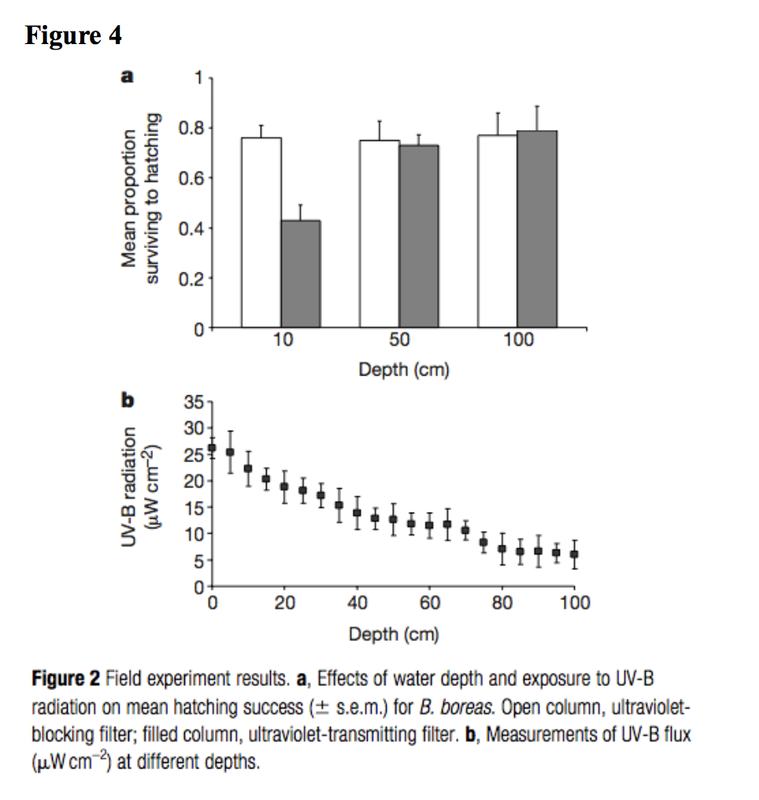 The greater exposure to UV-B radiation resulted in significantly decreased hatching success (see figures 3 and 4) (Keisecker et al. 2001). During development of the embryo (see figure 5), the jelly envelope surrounding the frog embryos would seem to have the most influence on the exposure to harmful UV-B rays. In some cases, the results are consistent with this hypothesis. The presence of a jelly envelope does play an important role in protection in Cascades frogs (Rana cascadae) and Pacific tree frogs (Hyla regilla) (Blaustein et al. 2003). 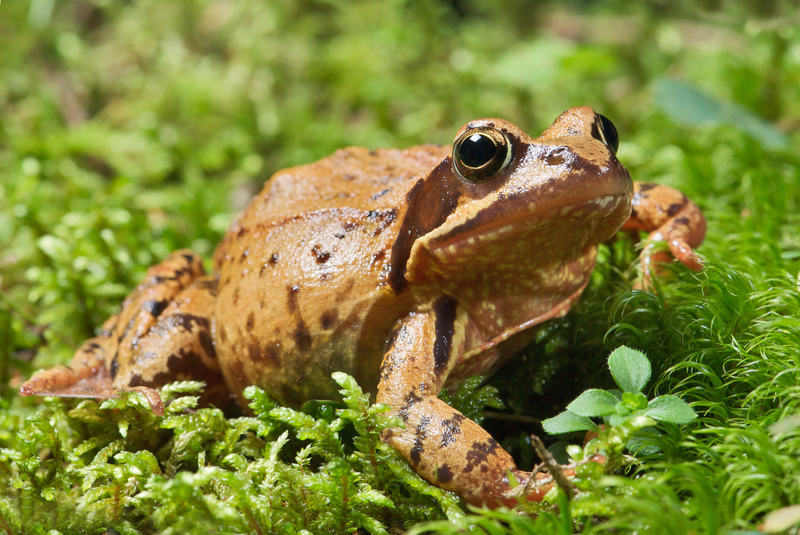 However, this is not the case for other species, such as the Common frog (Rana temporaria) (Ranasen et al. 2003). 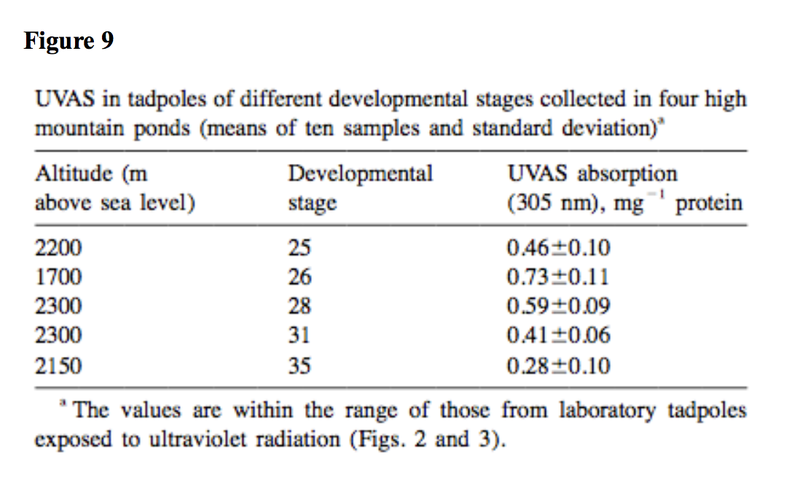 In the R. Temporaria species, removing the jelly envelope and exposing the embryos to UV-B radiation showed no significant difference in developmental success when compared to unaltered embryos (see figure 6) (Ranasen et al. 2003). During larval development, the effects of UV-B radiation can take many forms. It can range from poor development, edema/dropsy to axial malformations (Weyrauch and Grubb Jr 2006). At this developmental stage, the larvae have the ability to move around in the water and potentially avoid UV-B radiation by a behavioral modification. However, this does not seem to be the case. Considering that tadpoles are ectothermic, they have to be able to move into the sunlight in order to maintain their body temperature. However, increased sunlight exposure comes at a risk; harmful UV-B radiation is absorbed because of the sunlight. 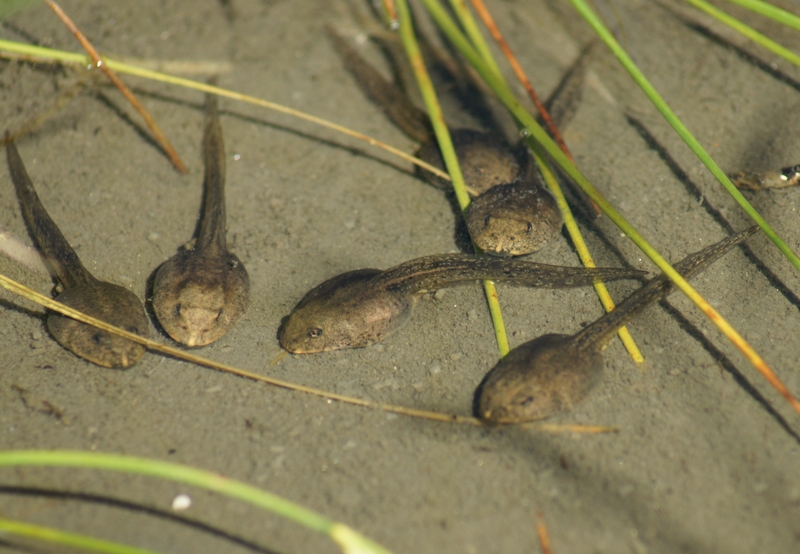 It was initially hypothesized that the tadpoles’ movement was in response to high levels of UV-B radiation, because the tadpoles would move up and down the water table (slightly) during different times of the day. 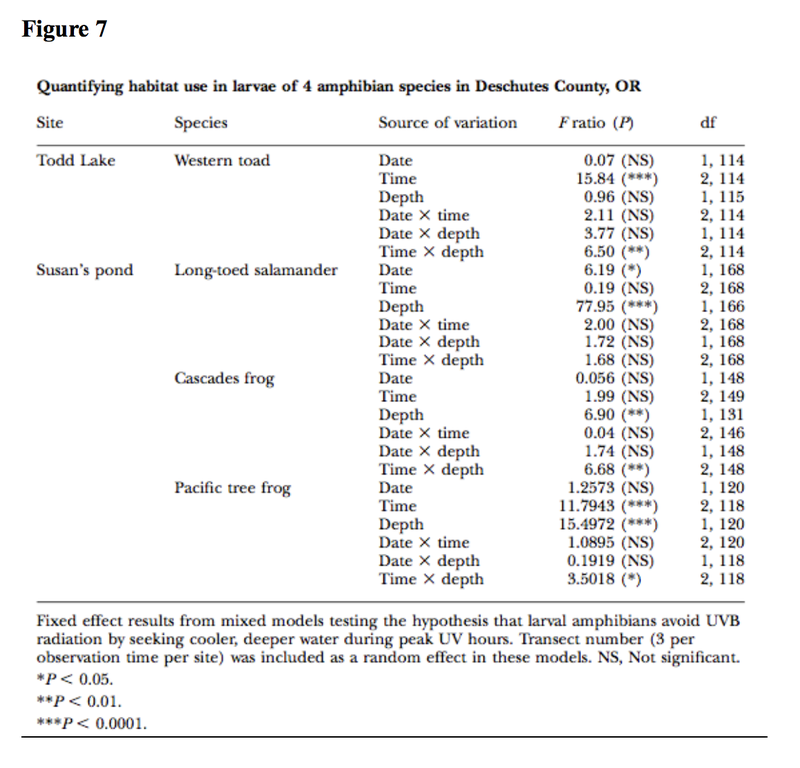 The hypothesis turned out to be incorrect, because tadpole movement was not due to UV-B avoidance, but primarily due to temperature of the water and the tadpoles’ individual thermoregulation (see figure 7) (Bancroft et al. 2008). Because of these potentially dangerous behaviors, it can be concluded that thermoregulatory behaviors were evolutionarily more important for survival than avoidance of UV-B radiation. This caused a selection for thermoregulation behavior in spite of the dangers of UV-B radiation. This hasn’t been a problem for populations of frogs until relatively recently, because the ozone layer has been shown to be deteriorating (Gardner 2001). This deterioration has allowed significantly more harmful UV-B radiation through which can cause (and has caused) significant problems for modern frog populations (Diamond et al. 2002). Unfortunately, there has not been enough time for the tadpoles to evolve UV-B avoidance behaviors (Bancroft et al. 2008). Whether it is physiological, molecular, or behavioral, the anurans have developed relatively successful ways of defending against harmful UV-B radiation. There are good examples of these various types of adaptions at each level of development. Some species of frog lay eggs that are naturally resistant to UV-B radiation. This is most likely due to highly efficient DNA repair pathways (Ranasen et al. 2003). These results were found by testing multiple species of UV-B resistant tree frogs (R. pretiosa and R. luteiventris, R. aurora, Hyla regilla) by removing their jelly envelope and exposing them to UV-B radiation. They showed no change in resistance with the jelly envelope removed (Blaustein et al. 2003). However, not all jelly envelopes serve the purpose of protection from UV-B radiation (Ranasen et al. 2003). In these cases, the egg has most likely adopted the adaptive strategy of pigmentation in the egg. This melanin productions acts as a natural sunscreen, and often times the amount of pigmentation will correlate directly with the amount of UV-B radiation the egg is exposed to (Blaustein et al. 2003). Like the egg’s melanin production, some anuran embryos will develop darker pigmentation that correlates with the amount of UV-B radiation. One example of this would be in Rana temporaria larvae, where larvae exposed to more UV-B radiation was a significantly darker color (Blaustein et al. 2003). 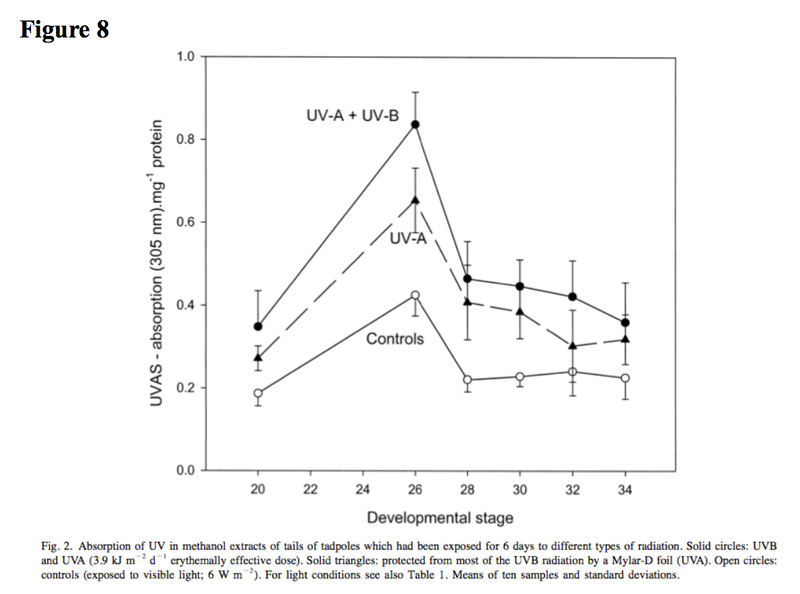 Another physiological adaptation would be the production of “UVB absorbing substance (UVAS)” (See figure 8) (Han et al. 2007). This UVAS was found on the skin of R. temporaria tadpoles and it absorbs UV-B radiation, at a maximum absorption at 290 – 300 nm. The tadpoles found with this particular adaptation were found, in this case, at high altitudes where the UV-B is more intense than it is closer to sea level (see figure 9). The development of this UVAS provided protection against the invoming harmful UV-B radiation (Han et al. 2007). Although embryos cannot change their behavior and tadpoles do not exhibit avoidance behavior, there is evidence that some species of adult frogs do behaviorally avoid harmful UV-B radiation. 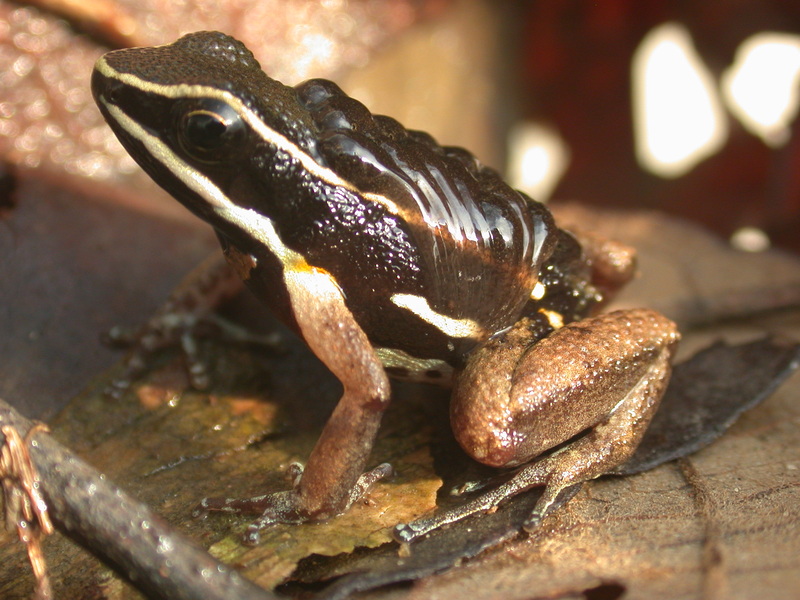 For instance, two species of tropical poison dart frogs (Dendrobates pumilio, D. auratus) have developed a statistically significant behavioral avoidance of harmful UV-B radiation. It is interesting to note that both of these species do not have any documented population declines (despite the increase in UV-B radiation in the tropics), and D. pumilio is the most abundant frog species in Costa Rica (Han et al. 2007). Many anuran species have developed behavioral adaptations in response to UV-B intensity in the environment. Many amphibians limit their exposure to sunlight by changing where they live. For example, if a frog population lived in muddy water or in leaf litter, it would limit their exposure to harmful UV-B radiation. These behavioral changes would result in a change in egg-laying location. 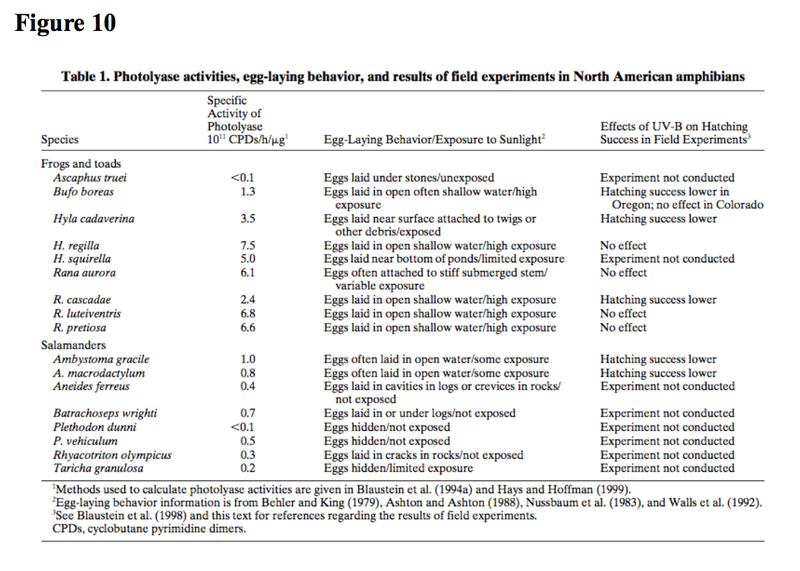 If the eggs were laid in an area without direct UV-B radiation contact, the problems associated with it would disappear, thus bringing the survival of eggs up significantly (see figure 10) (Blaustein and Beldin 2003). A factor that plays an important role in the effects of UV-B radiation and frog populations is the size and genetic diversity of the population itself. Genetic diversity may buffer frog populations against various environmental factors, including UV-B radiation. A small population is significantly more affected by an environmental factor than a larger population because of the important role that genetic diversity within the population plays. Larger populations have more diversity, so evolution to varying environmental factors is much easier. For smaller populations, a minor change can have drastic effects if the diversity is not available for adaptations to become fixed within the population (Weyrauch and Grubb Jr 2006). In many cases, other abiotic factors can have synergistic effects with UV-B radiation. For some populations, UV-B radiation may not affect them enough to make a difference. But when combined with temperature, the population is significantly affected (Corn and Muths 2002). The same additive effect can be applied to other abiotic factors, such as pH of the water (Bancroft et al. 2008, 2nd reference) or the water level (Corn and Muths 2002). In addition to abiotic factors, biotic factors can also have an additive effect on frog populations when coupled with increasing exposure to UV-B radiation. The pathogenic water mold,, has the to infect amphibian populations, thus adding yet another environmental stressor (Bancroft et al. 2008, 2nd reference). 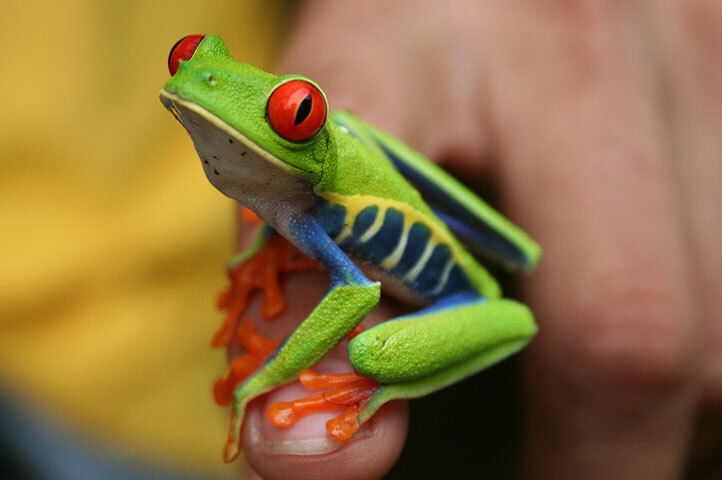 Frog populations are declining throughout the world, and this declining is due to many factors. One of the more important factors in this decline is ultra violet B radiation. It is a major problem because it can cause premature death at any point during the frog’s life cycle, as well as cause developmental issues and sublethal effects in frog embryos, tadpoles and adult frogs. While some frogs are capable of defending themselves against UV-B radiation, not all of them can do so effectively. There are various ways in which frogs have adapted to high levels of UV-B radiation, and these include molecular/genetic adaptations, physiological changes, active DNA repair mechanisms and behavioral changes. However, due to the rapidly changing climate in the last few decades, the populations of frogs throughout the world are unable to adapt fast enough. While the current levels of UV-B radiation may not be causing widespread extinction, it should certainly be of concern. If the increase in UV-B radiation continues to increase as it has been, there will be significant changes in many ecological communities, frogs being at the forefront of the impact. Blaustein, A. R., and L. K. Belden. 2003. Amphibian defenses against ultraviolet-B radiation. Evolution and Development. Diamond, S.A., G. S. Peterson, J. E. Tietge, and G. T. Ankley. 2002. Assessment of the Risk of Solar Ultraviolet Radiation to Amphibians III. Prediction of Impacts in Selected Northern Midwestern Wetlands. Environmental Science & Technology. Gardner, T. 2001. 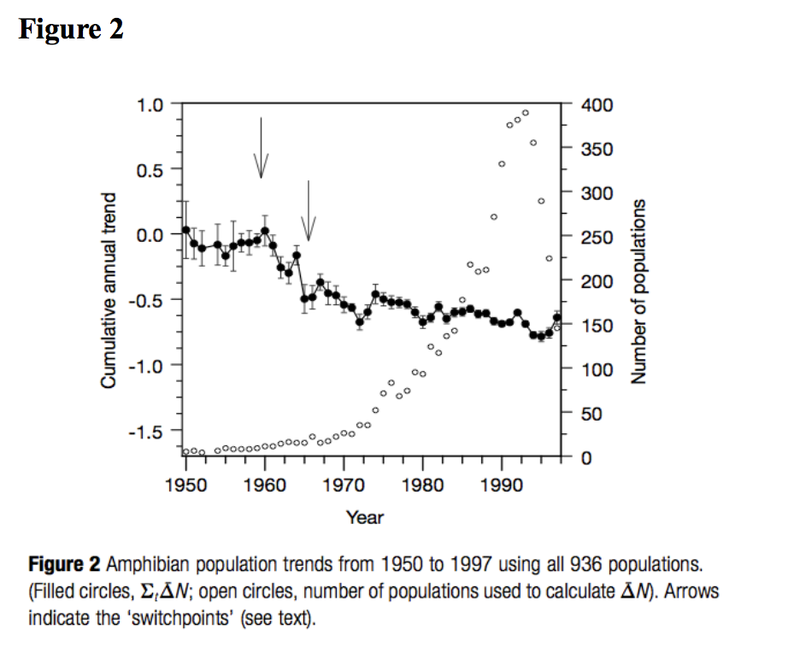 Declining amphibian populations: a global phenomenon in conservation biology. Animal Biodiversity and Conservation. Hofer, R., C. Mokri. 2000. Photoprotection in tadpoles of the common frog, Rana temporaria. Journal of Photochemistry and Photobiology B: Biology. This was a paper I wrote for Ecology (Bio315W) course during the fall 2011 semester.